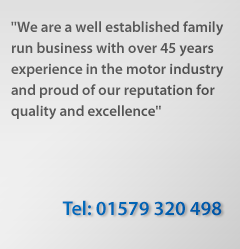 Doublebois Car & Commercial Services are a well established family run business with over 45 years experience in the motor industry. We are proud of our reputation for quality and excellence in motor vehicle repair at a competitive price. Doublebois Car & Commercial Services is centrally located in South East Cornwall and is within easy reach of Liskeard, Looe, Callington, Bodmin, Lostwithiel, St Austell and Saltash. Doublebois Commercial Services was started at the Industrial Estate in Doublebois near Liskeard in 1980. In those days Claude (known as Boss!) had one employee - Ron - who is still an integral part of the garage today. The following year Bill came to work with the 'boys' and the 'A Team' was formed. Since then the original team has grown to 14 employees including Claude. 2007 saw the development of a new commercial workshop and we now have 6 commercial mechanics and an apprentice. On the light vehicle side we have 2 mechanics and an apprentice. 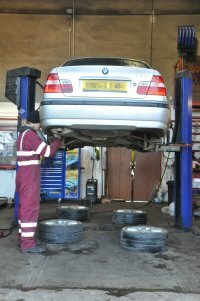 The garage has a dedicated full time MOT tester 'Ringer', who has been with Claude and the boys since 1986, and in 2008 a new MOT bay was installed. We are lucky enough to also have 2 other trained MOT testers so we are able to offer an uninterrupted MOT testing service. The services we offer include: MOTs, MOT repairs, minor and major services, clutches, exhausts and batteries, engine and gearbox repairs and or replacement, steam-clean and wax-oil, diagnostics, 4 wheel laser alignment. If you are looking for Car Servicing in Likeard, or have any questions please call Hannah or Sherry in the office on 01579 320498, or compete the Email Enquiry form.